Make the most of the faded charms of this lavish central London shoot location - while you can! Some shoot locations are reliable mainstays that you know will always deliver exactly what it says on the tin. Other locations have a more ephemeral and unique charm that must be taken advantage of during the short time that the space is available. One such temporary space is our ‘Lancaster Gallery’ location which, we are delighted to announce, has just re-joined our locations library. But for a limited time only – we are currently taking bookings on it only up until December – at which time it could literally be gone forever. The ‘Lancaster Gallery’ location was in fact built as two adjoining, stucco-fronted, seven-storey houses back in 1857, designed to serve as extremely grand family residences adjoining Hyde Park. They were designed the in the lavish Baroque style, popular at the time, with some French Mannerist touches. The two houses were converted into a sumptuous hotel in the Roaring Twenties with an Art Deco aesthetic pervading. To create the hotel rooms, many a dropped ceiling and partition wall was added. Then, many decades later, the hotel closed in 2008, was bought by property developers but is now back on the market. These property developers removed many of the partition walls and suspended ceilings to reveal many an incredible feature with the result is that the place is currently semi-derelict. 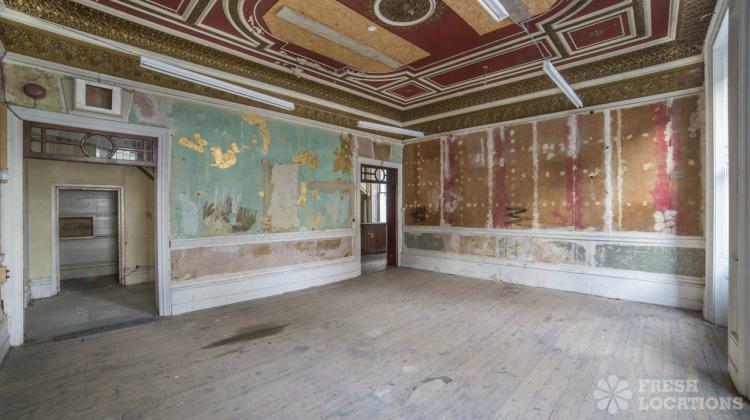 But this is precisely where its charms lie, in the juxtaposition between the location’s grand scale and wealth of opulent original features, and the flaking paint and crumbling plaster. This process of stripping back has revealed the building’s multi-layered history suspended in a state of arrested decay, delivering an enigmatic, layered look that serves as a truly unique backdrop for photography and film shoots. From the vast ballroom with its pretty plasterwork to the darker – in every sense – spaces to the back of the house, like the old lift shaft, which can lend a distinctly uncanny, ‘abandoned’ atmosphere to a shoot when required.